Today we’re heading to beautiful Steenberg about half an hour’s drive from the centre of Cape Town. Steenberg claims it’s the Cape’s oldest farm – established in 1682, and who am I to argue? There’s a lot going on here. A beautiful five-star hotel, a world-class golf course and vineyards producing award-winning wines. Plus two restaurants – and we’re visiting Bistro Sixteen82 – no prizes for guessing how they chose the name. Bistro Sixteen82 sets next to Steenberg’s winery. It’s a bright and contemporary space, surrounded by lovely gardens, a terrace and water features. And great mountain and vineyard views. Chef Kerry Kilpin’s menu is influenced by her love of Thailand, so you’ll find a lot of Asian flavours popping up in classic dishes. As well as an extensive menu choice there’s a board with specials chalked up and I went for the mussel special. 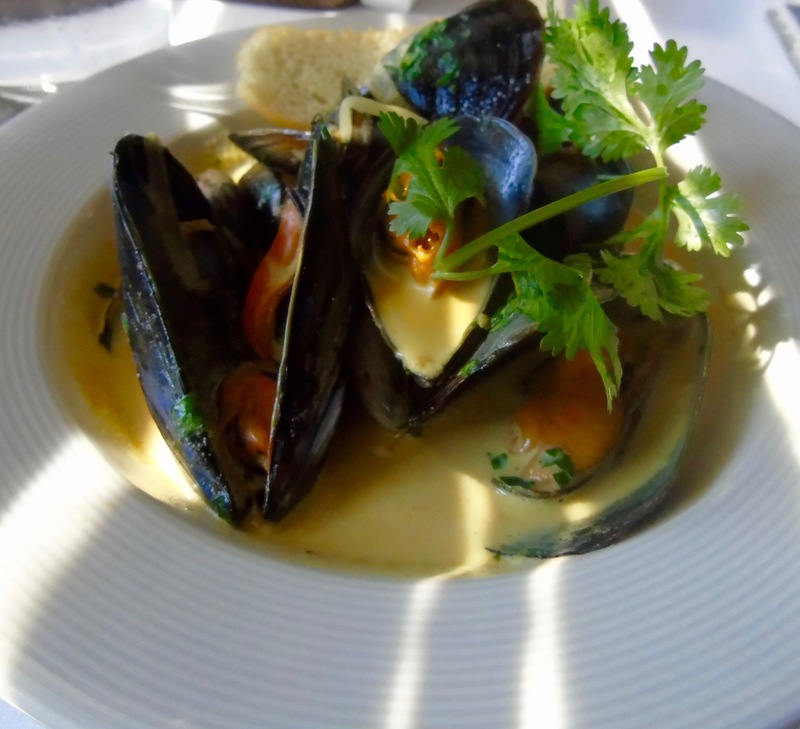 And it was very special, beautifully plump mussels served in a creamy saffron sauce. I’m loving the Cape Town mussels, just can’t get enough of them. 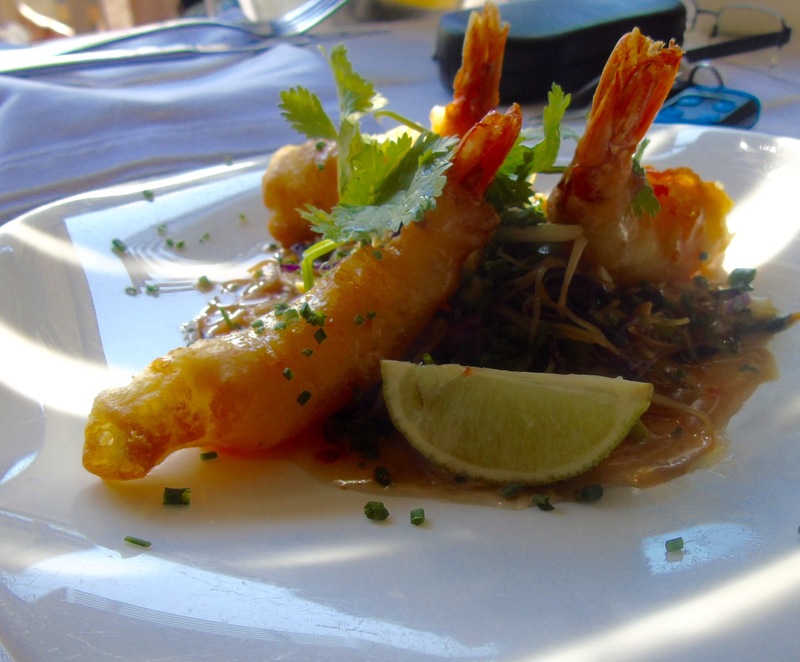 One of the favourites on the menu are the tempura prawns. Served with red cabbage, coriander and peanut noodle salad, miso mayo and red chilli syrup. An irresistible combination of flavours and textures, and a pretty plate of food, too. And how’s this for an exotic dish? 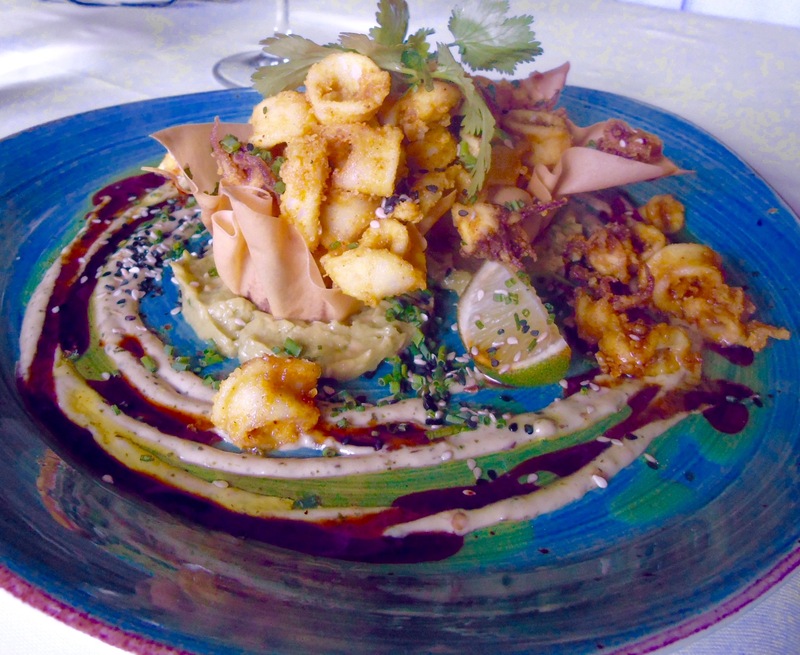 Curry dusted calamari is served with avo pulp, babaganoush sauce and soy syrup. They’re built up into little parcels of deliciousness. Our waitress did offer us the option of starters in main course portions, which is always a good thing. I often find that I’m more tempted by the starter selection. Having said, that, today was hard enough to make a main course choice as it all sounded tempting. 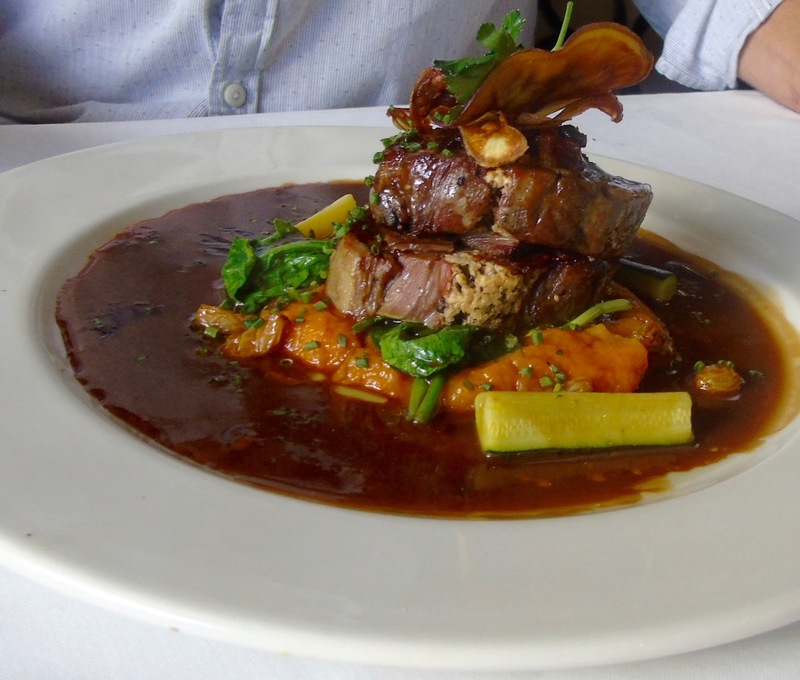 The braised lamb neck was stuffed with herb ricotta and sultanas and served with sweet potato puree, greens and rooibos and rosemary jus. I love this mix of South African and Italian ingredients. So after plenty of umming and aahing my main course choice took a sudden swerve when faced with the pressure of ordering and I went the pork belly. 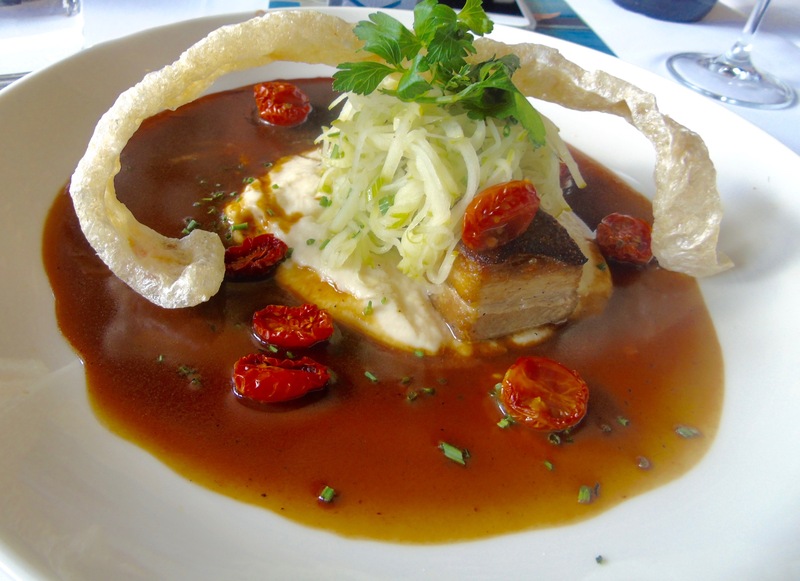 I’ve eaten a good selection of this delicious piggy cut in my Cape Town summer – it seems to be on most menus. Served with smoked cauliflower puree, a fennel and apple salad and cider jus, today’s dish is right up there on my list of favourite PB’s. The meat was melt-in-the-mouth and the zestiness of the apple and fennel made for a good contrast to the richness. Also, the cider jus was light and I loved the addition of slow roasted tomatoes which weren’t even mentioned in the description. Thumbs up! 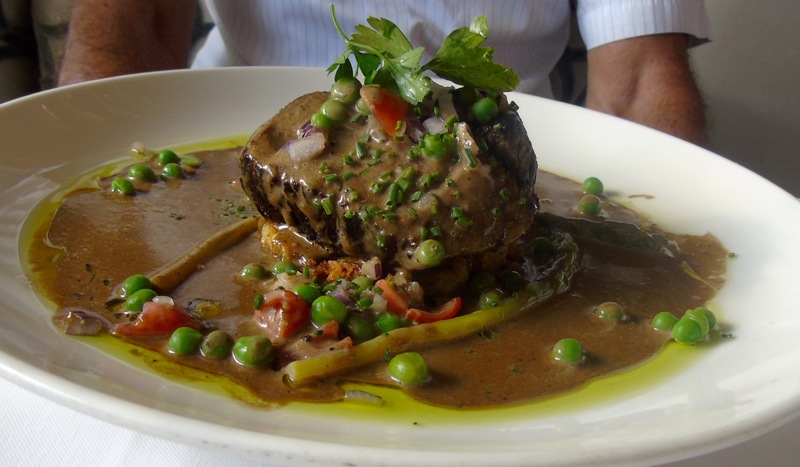 The beef fillet was grilled and served on a bed of potato roost, with asparagus, pea and tomato salsa and a creamy black pepper jus. Lovely tender fillet and another great sauce. Kerry is certainly a sauce-loving type of chef as you can clearly see by these pictures. And wonderful sauces they are too. Our lunch today was shared with four of our lovely Cape Town friends (thanks guys for an awesome lunch). So there were plenty of dessert lovers insisting on some sweet treats. I’m aware that I often don’t order pudding because I’m not that much of a sweet eater. 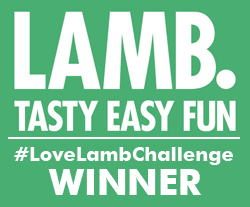 So today you’re lucky to be treated to what was actually the highlight of a very good meal – and that’s even for a non-dessert eater. Like this plate of pinkness. The yogurt panna cotta was served with rose vanilla ice cream, a phyllo cigar, fresh berries and lemon curd. 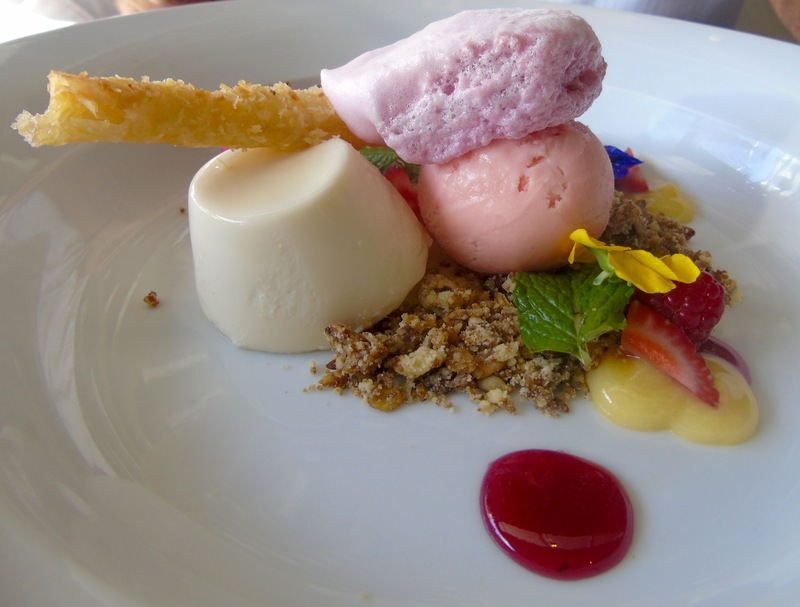 Now I am quite partial to a panna cotta and eaten with the rose vanilla ice cream it was simply wow. And how’s this for a work of art. The salted caramel chocolate ganache was served with peanut pinwheels, vanilla cream, peanut butter ice cream and a lace biscuit. Heaven for chocolate and peanut butter lovers – I mean peanut pinwheels?! What joy. Pud number three is the banana cheesecake and peanut macaroon. 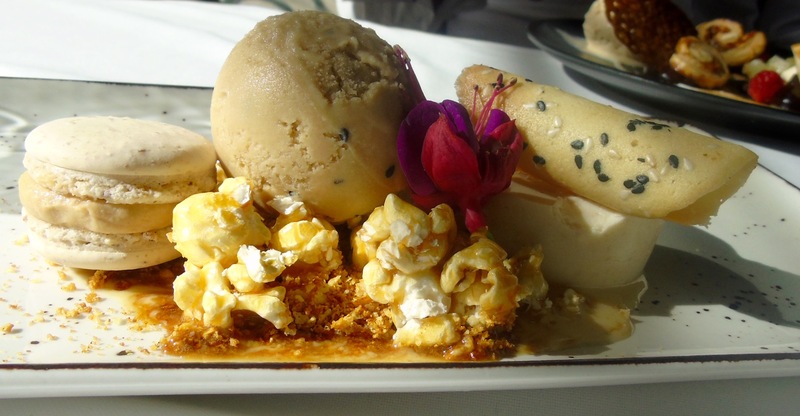 It’s served with sesame ice cream, creme anglaise, popcorn praline and honeycomb. Seems like six desserts in one! 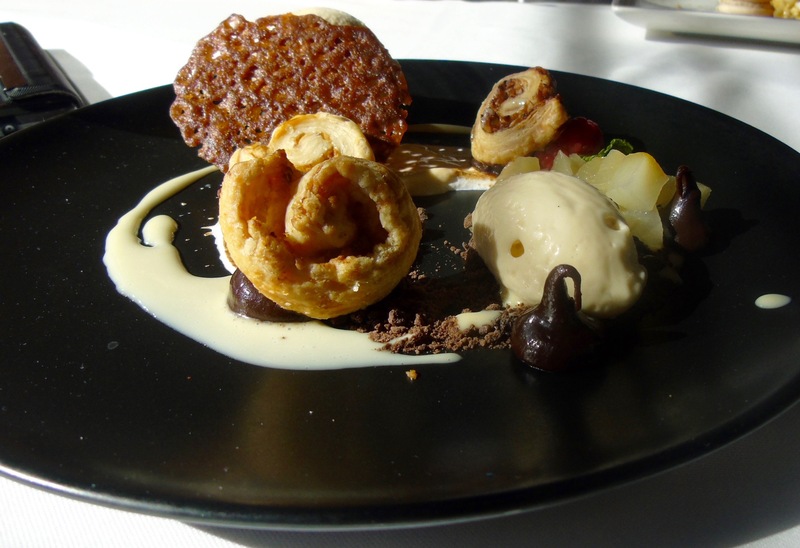 Well, those desserts simply blew me away – it’s worth visiting just for a plate of sweet treats. Although I certainly wouldn’t be able to resist the mains – or the starters come to that. Settle in at Sixteen82 for a long three-course lunch and savour Kerry’s delicious dishes. Oh and here’s today’s autocorrect annoyance. Steenberg being corrected to Sternberg EVERY TIME…clearly autocorrect doesn’t learn from being corrected – is there an irony in there somewhere? You will pay around R350 per person for three courses. That’s just over £20 at today’s exchange rate. All the courses are pretty substantial – making for very good value. Bistro Sixteen82 is on the Sternberg Estate, Steenberg Road, Tokay, about half an hour from Central Cape Town.